While the promise of Passbook was intriguing, the first release of Apple’s (s aapl) mobile ticket, gift card, coupon and loyalty card repository in September was an underwhelming user experience. It wasn’t listed as a new addition in the release notes, but I was pleased to see in the iOS 6.1 update on Monday that Apple has addressed one of my biggest concerns: helping people understand what Passbook does, why they would want to use it, and where they can find apps that work with Passbook. Apple has thankfully restored the Welcome screen to Passbook that explains what it does as well as the vital link “Apps for Passbook” that takes users to a special page in the App Store listing apps that are Passbook compatible. There you’ll find apps from companies like Sephora, Fandango and United, that were available upon launch. But Apple has many more available for download now. It’s a small thing, but if Apple truly wants to get its users used to paying for coffee or boarding planes or scanning a baseball game ticket with their iPhone, it’s important to guide them through it. I think Passbook is a great idea. Apple is always ahead of the curve, and often it takes other’s time to understand how innovative it is. 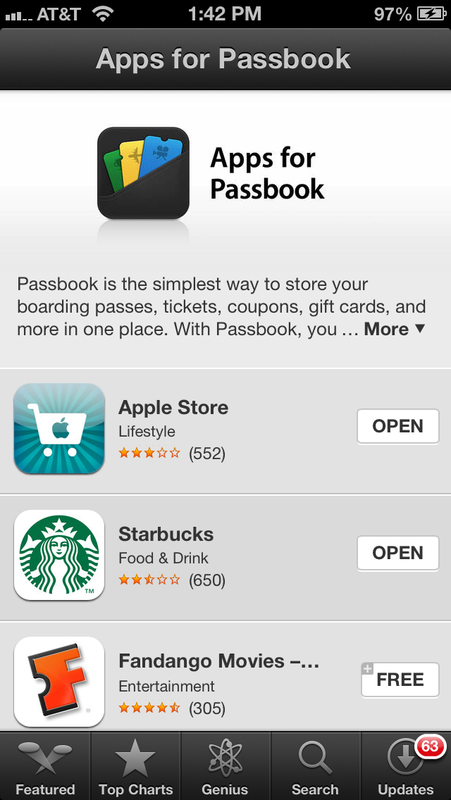 Because Passbook is native and included on the iPhone, it will slowly show it’s value. Right now, most people don’t understand it, but soon, e-coupons and passes will surpass redemption of paper ones. Instead of clipping Sunday coupons, you’ll save them in Passbook. I envision a time when you can even scan them from the Sunday paper into Passbook. This will save paper and encourage spending into the economy. Wait, you’ll see, it will happen. Businesses will see the value and start utilizing it. Google, Samsung, Android will all copy Apple, and the Passbook concept will dominate the coupon and ticketing industry. Eventually, Apple and the rest will figure out a way to take a bite out of this billion dollar redemption industry. Passbook app on iphone is stupid. ShopZooky is an interesting Passbook powered mobile app that lets you search and share nearby Facebook Offers right from your mobile phone and save your coupons to Passbook. You can share Facebook and Passbook offers with friends and discover more local Facebook Offers. Facebook Merchants can also use ShopZooky to create their own locally enabled Facebook Offers including very easy support for creating and managing Passbook coupons. The world is changing fast, and with it the ways of promoting your business. Itâ€™s no longer enough to stay with the tried and trusted methods of yesteryear if you want to keep up with, and even forge ahead of, the competition. â€˜Innovate or dieâ€™ is the cry as we march forward into a brave new year. Passdock provides everything you need to enable you to create Passbook passes that can then be utilised to promote your business to existing customers. Passes can be personalised and issued to customers when they are near the store, or round about the time when they usually go shopping for particular items. The issuing of coupons and information via Passbook passes keeps your customers abreast of what is happening in your shop. It enables you to communicate with them on a one-to-one level, creating a new dynamic of care, trust and friendship between the business and the client. For any business interested in developing and implement passbook with their existing systems, we are here to provide you any information you need. Try our system for free at api.passdock.com. If you are a business owner, marketer or developer looking to create passbook passes for your own business then visit http://create.passkit.com It’s the best Passbook Pass Designer, and is the easiest and quickest way for any business to get into mobile commerce. The whole “Apps for Passbook” thing is already being bypassed by passes delivered directly from websites, with more interesting uses and larger volume. Appsolutely :-) Our clients are distributing Passbook Passes via multiple channels (web (including social media), email marketing, SMS marketing, traditional print, from app etc..). And in many cases finding the most effective channel NOT via apps. Indeed what we find is that once someone Adds a Pass to Passbook they are more likely to then download the associated app. In other cases, smaller business are finding that they don’t need to waste time and money on an app as the Pass effectively operates like a mini app and is totally adequate for their needs. For any business wanting to easily create, distribute and manage Passbook Passes take a look at PassKit.com (there are also links to video tutorials and case studies). We provide end to end set of tools (Pass creation, Pass use/redemption tools, customisable behavioural analytics, and integration tools (for example integrating into your existing Point of sale system). Right now, you can trial for free with no commitment. It let’s you create your own IOU and gift coupons for Apple’s Passbook and send them to people.